What does transformative change look like on the ground in school districts across the nation? That’s what Reimagine Learning and The Peter and Elizabeth C. Tower Foundation wanted to understand when we embarked on a strategy to provide technical assistance to two school districts in Essex County in Massachusetts that are in the thick of transformation. As a part of our work with these districts, , we got a unique front row seat to—and, in some instances, were participants in—an intensive change process to help the young people in these communities, especially those who have been traditionally underserved, reach the same educational milestones as their counterparts in more highly-resourced communities. As we traversed the landscape for districts that we thought were ripe for change, we saw notable things happening in the Lawrence and Salem Public Schools. Both school districts had strong and passionate leaders and both leaders were especially committed to the low-income, high-needs students in their charge. In addition, we noticed that in each district, there were many talented and dedicated leaders and teachers, and a keen appetite for change in each community. We approached each of these districts, not with a specific agenda in mind, but rather, with a curiosity about their urgencies and how they might align with our capabilities. What developed from a period of relationship building and exploration with each district leader was a set of two very distinct projects, each of which represents a path to transformative change. In Lawrence, Superintendent Jeff Riley, who had been appointed by the Commonwealth of Massachusetts as the “receiver” of what was considered a failing district, had recently learned from a Harvard study that one intervention in particular—the Acceleration Academies—was having an outsized impact on test scores and other learning outcomes. The Academies consist of a week of intensive and hands-on learning for students in grades 3-12 led by exceptional teachers during February and April school vacations. He asked the Reimagine Learning team to investigate what about the Academies made them so successful. Our response was to create a multimedia case study called The Golden Ticket. You may have read about it recently in a letter from Reimagine Learning’s co-leads, Shruti Sehra and Jody Cornish. We hope that the website will inspire school leaders to adopt the Acceleration Academies model and/or implement the larger lessons learned to support the needs of all learners, including those with learning differences and other typically underserved students. The Academies are an example of a proof point or bright spot in a school district and how it can be leveraged for broader systemic change. In Salem, we first learned about the entrepreneurial mayor, Kim Driscoll, and her desire to transform the public schools from underperforming to the gold standard in educational innovation in the region. She recruited Margarita Ruiz, a veteran educational leader from the Boston Public Schools, to be the new superintendent. We met with both women two years ago and began exploring a potential partnership, not knowing what might surface. In the spring of 2016, Margarita Ruiz invited Reimagine Learning to be the external facilitator of the district's strategic planning process. The school district had recently emerged from Level 4 status (according to the Massachusetts Department of Elementary and Secondary Education's state accountability system), and the superintendent and her senior management team were eager to create and deliver on a bold vision for change. Over the next year, we partnered closely with them to engage the entire community in the strategic planning process. In collaboration with the district, we created six work teams and a steering committee that included approximately 70 community members and district staff and served as the backbone of the strategic planning process. We also held three Citywide Conversations – for both English and Spanish speakers – to solicit community input on the mission, vision, and values of the district. These events attracted hundreds of community members. 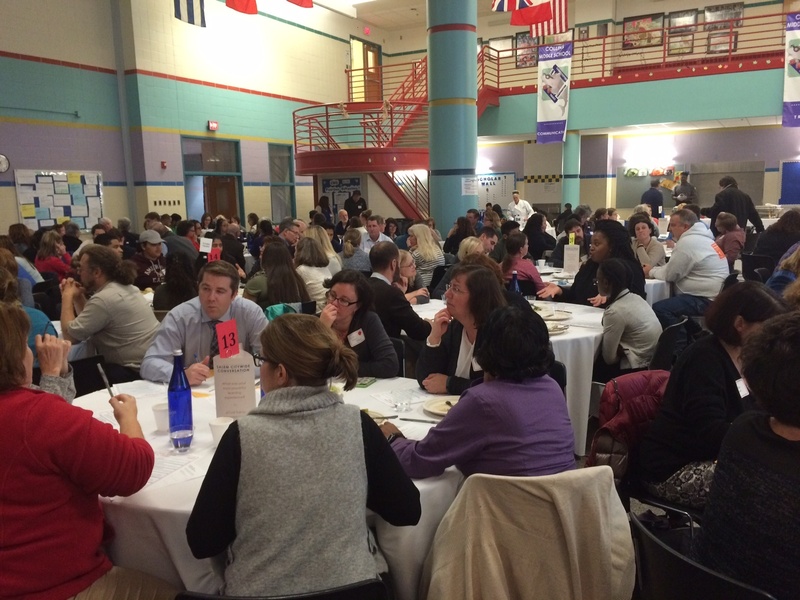 Focus groups for teachers, parents, and students were also held, and the district administered a community-wide survey to assess existing and emerging needs. The Salem School Committee approved the plan in May 2017 and the district has now moved into implementation. Reimagine Learning is currently codifying the tools and processes we used as facilitators so that other communities and districts may benefit from our work. Stay tuned for The Educator’s Guide to Community-Engaged Strategic Planning, to be released this fall. The Salem project taught us about the importance of creating the enabling conditions for innovation to take root and stick. Although these projects in the Lawrence and Salem Public Schools were very different from one another, both demonstrated to us how entrepreneurial district leadership and deep community engagement can, together, drive transformative change to improve the learning outcomes for all students. Interested in learning more about Reimagine Learning’s regional work? Have ideas about people or organizations who might be interested in The Golden Ticket and/or the Educator's Guide to Community-Engaged Strategic Planning? Please contact Jane Feinberg at jane_feinberg@newprofit.org.